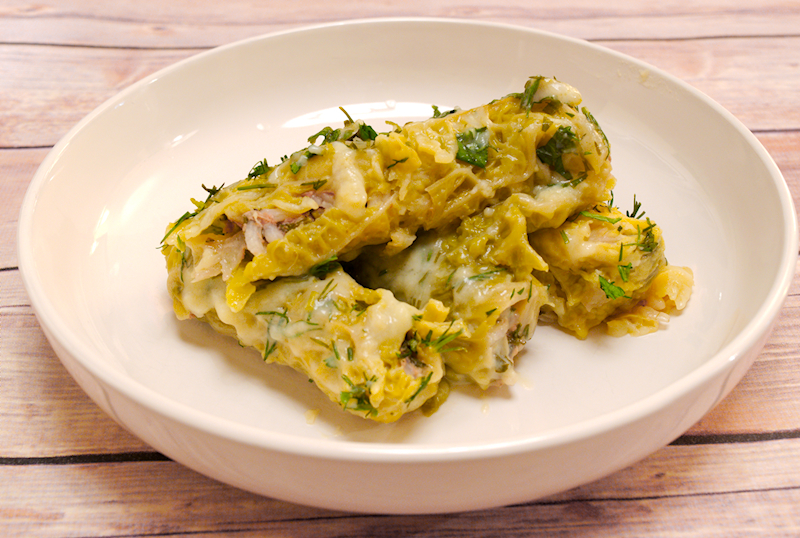 A delicious recipe for Greek stuffed cabbage leaves in an egg and lemon sauce. It’s the famous Lahanodolmades with Avgolemono. Stuffing vegetables with meat has been very popular in the Mediterranean and the Middle-East cuisines for centuries. 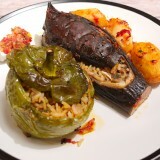 The word “Dolma” has a Turkish origin (Dolmak), which means “to be stuffed”. Depending on the region, the culture and religion people use different vegetables to stuff. 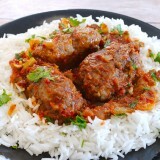 I guess the more popular version in the western world is the stuffed vine leaves (Yalanci Dolma) with rice and herbs. Stuffed vine leaves are very popular in Greece too and is one of my favorite meals. Traditionally it’s a dish that’s made in autumn, when the vine leaves are fresh and you can just collect them from your garden. 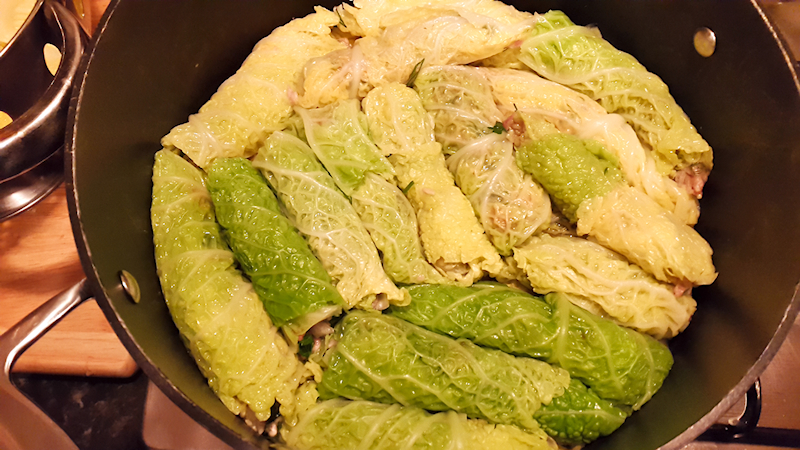 The winter version for Dolma is made with cabbage. They are called Lahanodolmades. They contain meat, which is usually veal or a mixture of veal and pork. In Turkey they are made with mince lamb, as you may guess. Lahanodolmades can be considered as a time-consuming dish to make as you need to roll the dolma one by one. Well, it’s not as bad as it sounds. First, using just 1 lb of meat you can make a meal that can feed 5-6 people or can last for a 2-3 days. Second, it’s something different, hearty and delicious! The Greeks make a special sauce to serve Lahanodolmades with. 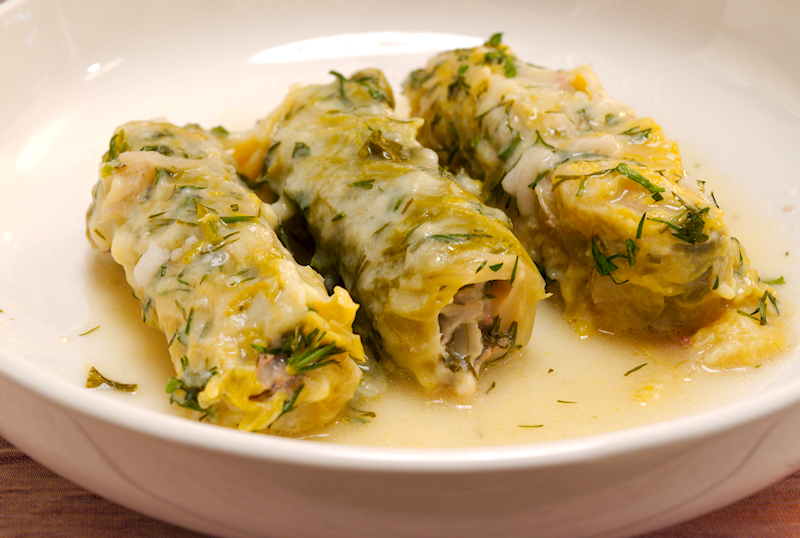 It’s called Avgolemono, which basically is eggs and lemon juice whisked together with some of the Dolma stock. Together with some corn flour and herbs, it brings Lahanodolmades to another level. 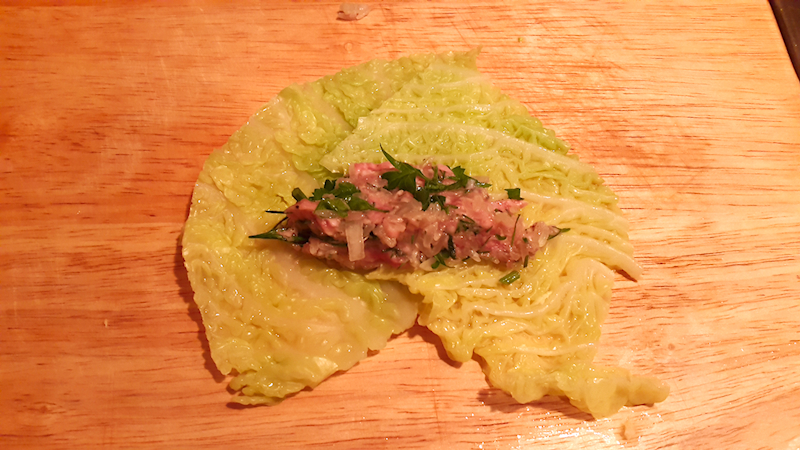 We had a whole cabbage in the fridge and Kondje wanted to give it a try and make Lahanodolmades. In such short notice we couldn’t find any mince veal so she made them with beef. You can use any kind of meat you like actually. As you may have guessed, Kondje made the Lahanodolmades and I just ate them! 500 gr (17 oz) mince beef. 200 gr (7 oz) rice (I used long grain). 1 onion cut in 5-6 pieces. 2 celery sticks coarsely sliced. ¼ cup of extra-virgin olive oil. 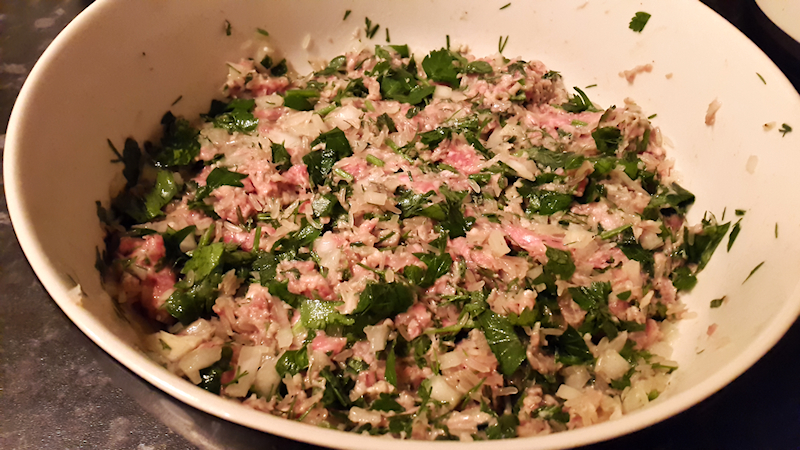 Add the beef, finely chopped onion, parsley and dill (save some for the sauce at the end), rice and olive oil into a bowl. Season with salt and pepper and knead well. Cover with cling film and set aside. Cut the cabbage in half. Use a knife and cut the core out. Add it in a pot with hot water and boil it for ~ 10 minutes until the leaves start to be detached from the main body. Remove it from the pot and separate the leaves. Peel the carrots and slice them coarsely (8-10 slices). 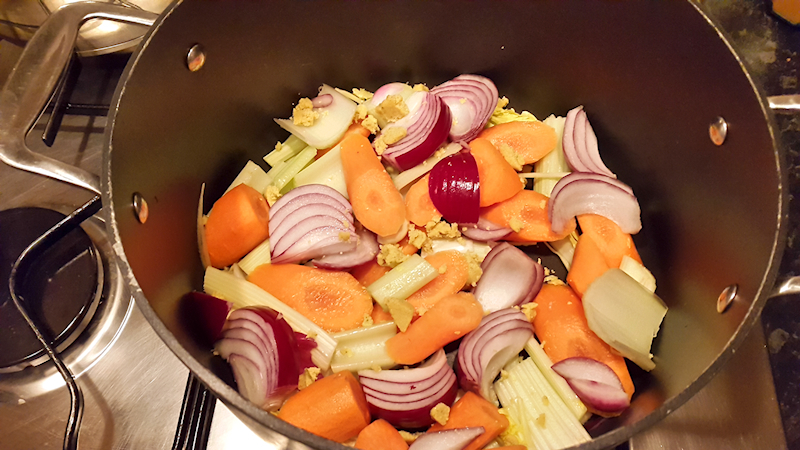 Add the carrot, celery and the coarsely cut onion in the bottom of a large and deep pot. Use some of the cabbage leaves that are damaged to cover them and create a base for your dolma. This will be your stock. 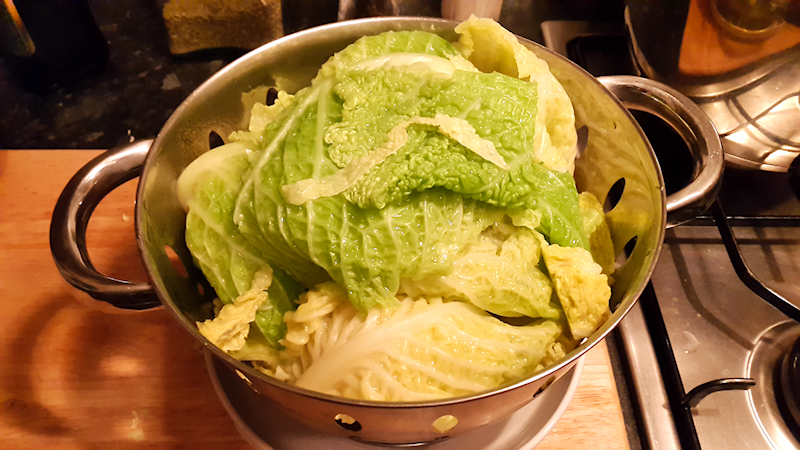 Place one of the boiled cabbage leaves (with the vain side up) on a flat surface (a large plate will do). Add one tablespoon from the meat/rice mixture close to one edge of the leaf. Start rolling the dolma tightly, making sure that is sealed on both sides. Place the dolma close to the wall of the pot, on top of your stock vegetables and cabbage leaves. Prepare the next dolma and add it next to the previous one. Add the rest of the dolma trying to create homocentric circles. Just make sure the circles are tight so the dolma will not disintegrate during the cooking. Depending on the size of the pot and the dolma, you may need to make the same kind of structure on top of the first one. 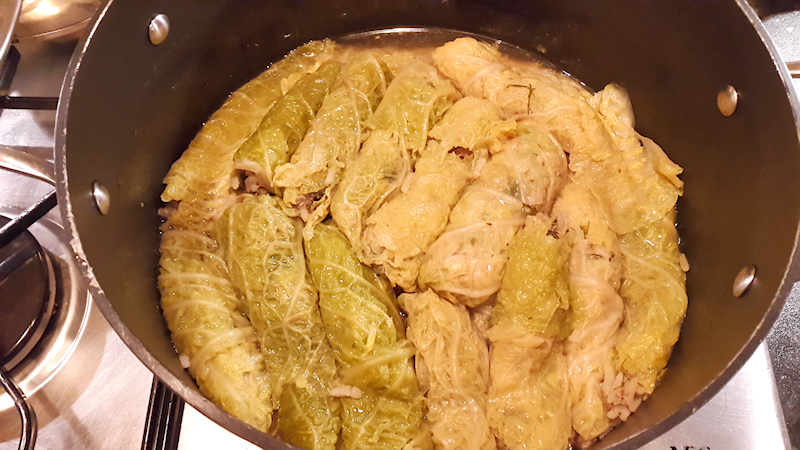 Use the remaining or damaged cabbage leaves to cover the dolma. 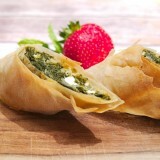 Use a suitable plate and place it facing down on top of the cabbage leaves. The weight of the plate will make sure that the dolma will not move while cooking. Add some hot water until the plate is just covered. Cook the lahanodolmades at low heat with the lid on for ~ 1 ½ hours. To prepare the egg and lemon sauce, whisk the eggs in a bowl. Add the lemon juice and keep whisking. Use a large spoon and introduce some of the cooked dolma juice into the bowl while you keep whisking. It is very important that you keep whisking so that the eggs do not get cooked by the heat of the juice. Add some more and keep whisking. Add the corn flour and keep whisking. Pour the sauce on top of your dolma, shake the pot well and let it cook for another 10 minutes at low heat. Serve the dolma hot with the nice egg and lemon sauce from the pot.